Then, inspired by, School’s Out, a documentary about Forest Kindergartens in Switzerland, and encouraged by principal, Amos Kornfeld, Eliza enlisted a former intern, Meg Teachout, to help her develop a more frequent outdoor program for her kindergarteners. After attending a course at Antioch University New England and receiving funding from the Byrne Foundation and the Wellborn Ecology Fund, Eliza and Meg embarked on their first year of ForestKinder—one day every week in the woods. You can join this joyful community of educators by registering for the 2018 Outdoor Play and Learning Professional Learning Community. Eliza is currently working on a book to be published this summer. 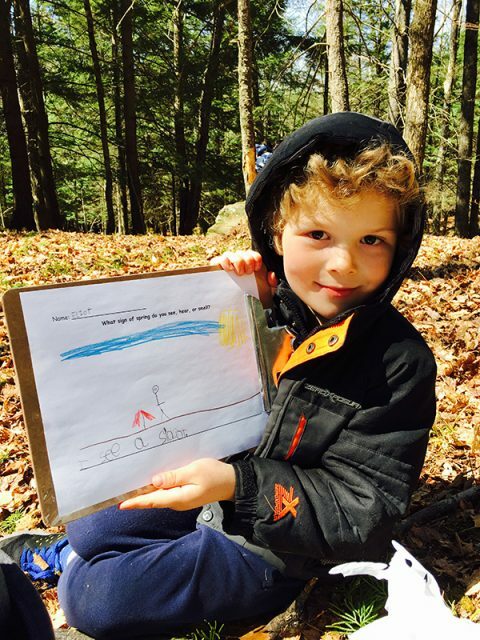 “The Forest Days Handbook: Program Design for Nature-based School Days,” with a foreword by David Sobel, will answer the greatest hits of how-to questions for early and elementary educators seeking to commit to taking their students to a local wildspace for play and learning. Photos and seasonal narratives will accompany the details to provide a healthy dose of inspiration to teachers, administrators, and parents. My second tip is to find a collaborator. Find a parent, a grandparent, a colleague, an administrator, an intern, anyone who will take on this project with you. It is hard to do something new, to think outside of your routines, to gather materials, to make a call on threatening weather, to start a fire, to haul the pee-bucket. Doing it in collaboration with a good partner is so much better.